Published by James Laymond Publishing, The Blank Cookbook is a great resource for referencing recipes, passing recipes down family lines or giving away to friends. No more searching through pantries for recipe cards or digging through them once you find them. 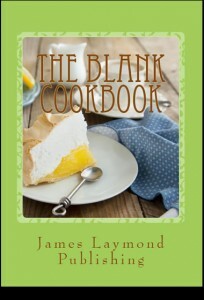 With this blank cookbook you can store your recipes easily in your own book. Sections of the book include ingredients, cooking preparation instructions, and serving instructions. You’ll also find a section to record family memories based on the meals that brought you together. For example, “Whose favorite food was this?” The back contains a section for notes and a cooking measurements chart.